It's hard for many of us to look back on the invention of septic tanks, sewerage farms and reticulated water without shedding a few tears for auld lang syne and a few for old green tree frog. 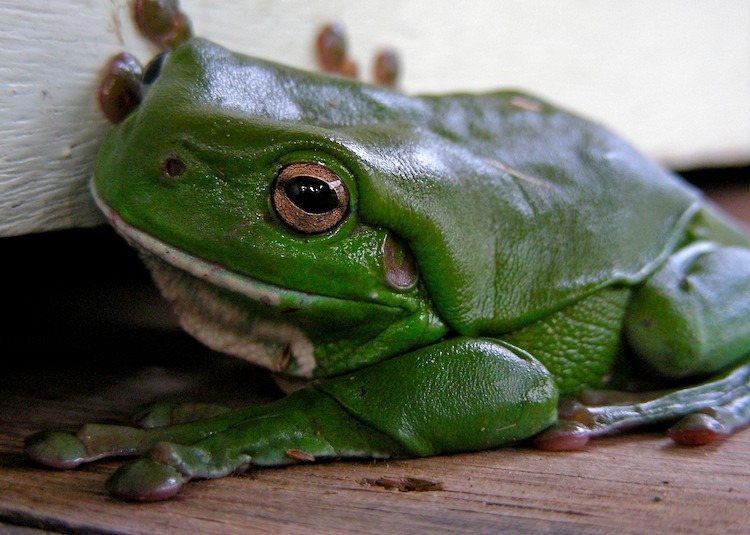 For there, among the galvanized clutter of overflow drains, slimy tank stands, thunderboxes, stink pipes and dripping taps, dozed the king of croakers, the mighty green tree frog, undisputed lord of the outside loo. And it was in the rainwater tanks, at the very end of the dry season, when the green tree frog and the water were down to the last rung, that their thunderous booming welcomed in the first of the summer deluges. The effect of a good reverberating tankful of bullroarers was then measured on the Ritcher scale and the potential of the approaching wet season predicted. Likewise, in the humble little outhouses, a prodigious cohort of clammy green cockroach gobblers patrolled by night. Everyone from that aromatic era knows that no respectable backyard lav was ever equipped with an electric light. The darkness was faced head-on with a collection of old weeping candles and half-dead torch batteries. Our privy was as black as a caved-in coal-pit; our exhausted blobs of candlewax were always beyond ignition and our torch hadn't seen new batteries since the first set died, haemorrhaged and digested everything around them. This meant that each nocturnal outhouse operation that required illumination had to be performed to the flicker of a judiciously struck match. In retrospect this system probably differed little from family to family. In fact, in those days the accomplishment of normal, healthy childhood toilet training relied on the proven horror-of-the-dark, burning-of-the-fingers technique. 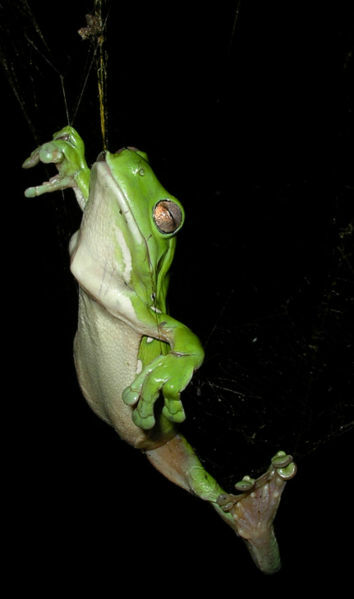 But running high on the list of consuming night-time terrors was the worry that if the match ran out enroute to the dunny, a big, cold, spongy green tree frog would have materialized in the darkness, either on the door knob, or directly, underfoot, or right in the opening path of the shuddering door. While it was always impossible to tell who got the biggest shock -- green tree frog, child, parents or neighbors -- it was never hard to tell who screamed the loudest. - Unexpected and ear-splitting was the screech that whatever had constituted the purpose of the visit was gladly aborted in favor of a soul-restoring nip of brandy administered by a sympathetic mum back in the kitchen. It's a wonder we weren't alcoholics before puberty! But black nights were quickly used for black comedy when uninitiated dinner guests were compelled to visit the lean-to. For this dubious cause, brotherly talents were combined to grab an old dependable green tree frog from in or near the letter-box and plant him inside the outhouse. This way, if a visitor's hand wasn't ravaged by the black hen which nested in the sawdust-box, the hand inevitably fingered the green tree frog lying camouflaged in the soft green apple papers nailed to one of the throne-room noggings. It is an ironic twist of homeopathic proportions, that the high blood pressure generated by these loo-lurking detonators was later to be medically controlled by a substance called caerulein, which was isolated from the protective slime on the back of the green tree frog. However, anything other than small, medically supervised doses of caerulein can do such unspeakably horrendous things to the human gut wall and gall bladder that green garnishes of frogskin are a definite no-no in Aussie camp-fire cuisine and are side-stepped by all bush cooks happy to be pink and not green around the gills. With the demise of domestic tanks and backyard dunnies the future became grim for these slimy springers. But against swamp reclamation, insecticides and the aggressive competition of introduced cane-toads, the future of the green tree frog species on the domestic urban scene is decidedly bleak. This prognosis may actually please the faint-hearted, whose appreciation of green skin and webbed feet begins and ends with the Muppets. But to others, who as youngsters fell asleep to the sound of a friendly old grandpa frog going "gar-ork, gar-ork" outside in the meter-box, no amount of felt puppets or television can replace a quality of life that is slipping through our fingers as quickly as a handful of tadpoles. Not too long after the Point Lookout Hotel was built, a large amphibious party of freeloaders decided to try out 20th century technology and sprung into the flash new septic ablution block. Here the frogs chose to camp out of sight inside the shiny new pedestals, tucking themselves in under the flushing lip, just below the seat. Like sticky green sandbags, their clogging effect not only gummed up the hydrodynamics of the ultra-fashionable flush. But when suspicious guests gazed into the abnormally churning maelstrom, what they beheld either sent them packing or looking for a doctor, depending on what they'd been drinking for lunch. The poor frogs who had been born and bred in the backwaters of swamps and rainwater tanks thought that every flushing cascade was a fresh summer downpour and cause enough to clamber out and go a-wooing. So many guest preoccupied with lid closing came close to a coronary when old Jeremy Fisher, or one of his offspringers, spread their glutinous digits over the seat and hoisted themselves up out of the porcelain like the creature from the Black Lagoon coming up for air. The green tree frog eventually moved on to less disruptive pastures and their grand plans to leap along with modern technology unfortunately amounted to no more than a flash in the pan.